ZARAGOZA, Spain, September 28, 2010 (ENS) – Chemical contaminants in a work environment can interact with noise and modify the way in which work-related deafness manifests, according to new research conducted by Spanish scientists. Noise-related hearing loss is the most common occupational disease in Europe and is increasingly common among young people. “Workers exposed to noise in the presence of metalworking fluids exhibit a delay in hearing alteration in comparison with those exposed only to noise at the same intensity,” said Juan Carlos Conte, lead author of the new study and a researcher at the University of Zaragoza. In the study, published in the journal “Anales del Sistema Sanitario de Navarra,” the team analyzed the way in which various physical and chemical contaminants interact, and the impact this had on hearing alteration in 558 metal workers. “A problem we detected with respect to welding fumes in the presence of noise was that the protection used is effective for reducing the intensity of noise, but not for reducing the effects of the chemical contaminant,” Conte explained. Cellulose masks or others made of similar compounds had little effect in this case, since their capacity to filter particles such as charcoal had no effect on toxic gas molecules such as carbon monoxide. In noisy atmospheres with metalworking fluids, people have the advantage of being able to use masks as respiratory protection, the researchers found, although the ear protection must be used in the same way to ensure that a worker is comprehensively protected from noise. 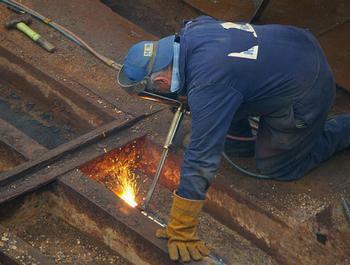 The researchers point to other factors in work-related hearing loss. Tobacco was found to contribute to initial acoustic trauma, while exposure to noise outside the work environment impacts on advanced acoustic injury. The European Agency for Safety and Health at Work recognized in 2006 that noise-related hearing loss is the most common professional disease seen in Europe, and suggests greater focus should be placed on combined risk factors in workers exposed to the combination of high noise levels and chemical compounds. In the United States, the relationship between chemical exposure and hearing loss is beginning to be better understood. Scientists with the Hearing Loss Research Program of the Centers for Disease Control and Prevention published 40 manuscripts on chemical-noise interactions between 1989 and 2005. The National Institute for Occupational Safety and Health, NIOSH, says while there are chemicals commonly found in industry, construction, and agriculture that are hazardous to hearing alone, or when combined with noise, there is very little awareness in the occupational health community of the chemical hazards to hearing. 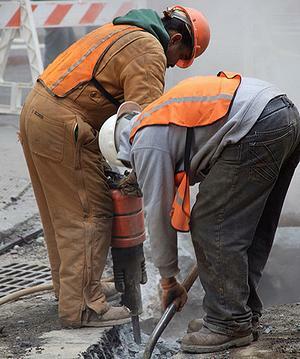 NIOSH estimates that almost 10 million American workers are exposed to occupational combinations of noise and chemicals that pose a hazard to their hearing. These chemicals include metals, solvents, insecticides, herbicides, and asphyxiants. Some studies have indicated the combined effects of noise and chemicals on hearing are increased over what would be observed for exposure to either noise or the chemical alone. The agency noted as far back as 1994 that the degreaser trichloroethylene when combined with noise put workers at greater risk of hearing loss. Also listed as hearing hazards were solvents toluene and xylene, found in solvent mixtures such as paints, varnishes, and thinners; and styrene, used in the production of plastics, synthetic rubber, resins, and insulating materials. In its review, the Institute of Medicine recommended that such exposures be included in a surveillance initiative that examines hearing hazards. In response, NIOSH established a goal that by 2016 it would track noise exposure and occupational hearing loss in three high priority industrial sectors – mining, construction, and shipyard manufacturing.